Nowadays, Himalayan peaks draw the attention of climbers, adventurers and cultural enthusiasts from all over the world. Even though there are many destinations worth seeing in Nepal, one spot stands out from the rest. Now, we are referring to the Island Peak also known as Imja Tse. Today, this mountain is considered the most popular peak in Nepal. What makes Island Peak trek so appealing is the fact that visiting it will be interesting for both novice climbers and experienced trekkers. If you are one of those explorers who want to experience a peak climbing adventure in Nepal, then Satori Adventures is the company you need. Island Peak trek is the perfect choice that almost everyone with a basic level of fitness can complete. Whether you want to complete this trek with 2 or 12 people, we’ve got you covered. This 19-day journey will take you to Kalapathar, which is an excellent photo spot. From this vista point, you will be able to enjoy the most beautiful views of the Himalayas all at once, including the Everest, Lhotse, and Nuptse mountains. In addition to that, you’ll also be able to see the Khumbu Icefall located at the head of the Khumbu Glacier. Another significant advantage of selecting the Island Peak tour is that it is considered one of the safest treks one can make in the Himalayas. You can rest assured that we run all our treks in the most responsible way, following all comfort and safety standards. Satori Adventures experts ensure the medically trained and experienced professional to lead your trip to Island Peak expedition. You can rest assured we will provide you with all the necessary equipment to prevent any problems that may arise during the trip. Before the journey, we will customize a unique climbing training session for all the tourists. This training session is aimed at helping you receive professional training from experienced climbing specialists on required climbing skills to scale the trip successfully. What makes Satori Adventures stand out from the crowd is the fact that our clients can either add or reduce activities when confirming the trip. For example, if you want to add some special services or, on the contrary, — lessen them, we’ll easily do that for you. The price will be adjusted according to your preferences. Island Peak trek in Nepal is the perfect option choice for those people who want to witness breathtaking views of Khumbu region. Thanks to the low elevation of 6,165m, there is no need to spend days acclimatizing to the altitude. If hike to Everest is all you are dreaming about, then Island Peak trekking is just for you. This journey will give you an unforgettable sense of achievement as you would on the top of Everest. Wait no longer — book Island Peak tour at Satori Adventures now! 16 April/Day 02: Preparation and briefings at the departments of tourism. Last minute shopping. 19 April/Day 05: Rest day for acclimatization.You will be hike to the famous Everest View Hotel (3800m/12487ft) 3hrs and catch a glimpse of Everest. After you can explore Hilary and Sherpa museum in Namche.In the evening they have a slide show program as well. 01 May/Day 17:Leisure dayshopping in Kathmandu. Fair well celebration dinner with culture program in the Evening. 03 Sept/Day 02: Preparation and briefings at the departments of tourism. Last minute shopping. 06 Sept/Day 05: Rest day for acclimatization.You will be hike to the famous Everest View Hotel (3800m/12487ft) 3hrs and catch a glimpse of Everest. After you can explore Hilary and Sherpa museum in Namche.In the evening they have a slide show program as well. 18 Sept/Day 17:Leisure days hopping in Kathmandu. Fair well celebration dinner with culture program in the Evening. Schedule flight tickets for Kathmandu-Lukla-Kathmandu to all the climbing members, Sherpa guide. All trekking and mountaineering equipment available at the advanced base camp. 3 meals a day, breakfast, lunch and dinner with tea/coffee available in the tea house/hotel/lodge during the trekking. Trekking permit (Everest national park entry fee). Expedition royalty and climbing permit of Nepal government to climb Island peak. 2 expedition members will have 1, V25 North face 4 season tent available in the ABC. 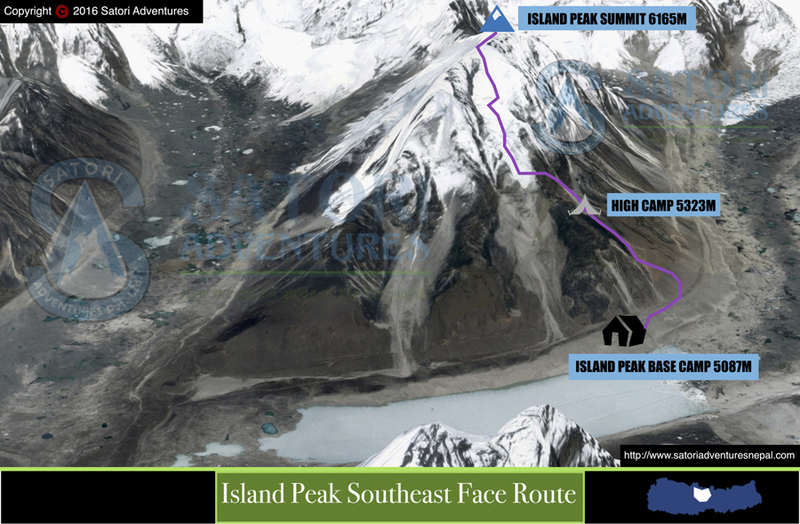 Trekking and climbing map of Island peak. Satori Adventures and Expedition aims at giving proper information to many travelers, trekkers and climbers who have some confusion regarding the booking process of the trip in Nepal.Satori Adventures therefore desires to provide guideline for the first-time visitors or travelers so that they can comfortably start the process to book the selected package legally. Before starting the booking process we always advise our trekkers, travelers and climbers to intelligently check whether the company is genuine and whether they are fully safe to travel in the company’s guidance. We ask them to be acquainted with the company they want book their holiday trip with. Is the company genuine and authorized from Government of Nepal, Office of the Company Registrar, Department of Tourism and Civil Aviation, Nepal Rastra Bank ‒Central Bank of Nepal (authorized for foreign currency), Permanent Account Number (PAN), and the Department of Cottage & Small Industries). Are they financially secured and environmentally conscious? We advise them to make sure about these formalities because there are some companies in Nepal that have been running business without abiding by the rules and regulation of the Government. Some companies were once registered but by now their licenses have already been expired and yet they have providing the services illegally. At the bottom of the itinerary (end of the page of the package) you have the following options:Book now, ask expert, write a review and print. Once you click book now bottom it will l take you to booking page ask expert will allow you to e-mail us in case of any query related to the package. You have to read ourTerms and Conditions before you book the trip; it explains to you the booking timing, the deposit and advance payment requirements, policies, procedures for cancellation, refund and the payment classification. Please kindly submitTrip Booking Form when you confirm the trip with us. It will be easy for us to process for your trip conformation and prepare all legal processes and permit for the trip. If you have any query, always feel free to contact us at any time.We always want to make sure our clients are well informed before conforming the trip. You are always advised to visit our website and related package for further information.